The use of specific semiotic tools to effect a longing for a past time and place has been used by many artists in order to create an emotional response in the perceiver of the work. Multimedia formats, which give the creator greater control over the semiotic associations formed by a work, have the ability to manipulate nostalgia with even greater precision. The medium of video games, which generally incorporates narration, sound, visuals, and interactive gameplay, provides a rich opportunity for exploring the nature of nostalgia and the ways music can be used to create it. Bastion, Fallout 3, and theLegend of Zelda are three very different games that use music to evoke nostalgia both inside and outside the gaming universe. Bastion (2011), an indie game for PC, Xbox 360, and iOS, manipulates the player into feeling a nostalgia for a lost in-game world. Fallout 3 (2008), a role-playing game developed and published by Bethesda for PC, PS3, and Xbox 360, uses the player’s existing understanding of music to effect a nostalgia for the past in the real world which the character has never known. The Legend of Zelda, a series of action-adventure games developed and published by Nintendo, uses music to manipulate the player’s own nostalgia for the games to mirror that felt by the protagonist. Thus these three games function as examples of possible nostalgias: the character’s nostalgia, the player’s nostalgia, or a nostalgia shared by both. Nostalgia is a slippery word to define: the Oxford English Dictionary defines it as “a sentimental longing or wistful affection for the past, typically for a period or place with happy personal associations,” simply describing a feeling. If one searches Oxford Music Online for the term “nostalgia,” 345 results appear: 193 of them are subject entries, ranging from Turandot to “Accordion,” from “Philosophy of Music, §2: Historical Survey, Antiquity–1750” to “Rap.” Even though the concept of nostalgia appears in such widely disparate musical settings, to say nothing of the composer biographies in which it is included, it does not have a subject heading of its own. While there has been some conceptual disentangling of the elements of nostalgia, much of it has appeared in other disciplines: for instance, Kimberly K. Smith (2000) considered the origins of the term and the history of the concept from a political point of view, while Svetlana Boym, a Professor of Slavic and Comparative Literature, has published several books on the topic. The result is a wide body of literature that uses both very nuanced definitions of nostalgia as a socio-political trend beginning in the nineteenth century, as Leon Botstein (2000) does, as well as a lay sense, as in a sense of “homesickness.” This terminological ambiguity, combined with the lack of an easy and accessible musical definition, can make nostalgia a difficult topic to discuss with clarity and detail. At first glance, nostalgia is a longing for a place, but actually it is a yearning for a different time… The nostalgic desires to… revisit time like space, refusing to surrender to the irreversibility of time that plagues the human condition (Boym, quoted in Kangas, 2011, p.222). Nostalgia, then, is comprised of both place and time. The relationship Rousseau described can be categorised as an indexical or symbolic sign as understood in Peircian semiotics, which Thomas Turino related to music in his 2008 work, Music as Social Life: The Politics of Participation. There are three major types of signs: icon, index, and symbol. Iconic signs function through their resemblance to the thing signified; for instance, caricatures are iconically linked to their subject on the basis of a perceived resemblance. Indexical signs are those created by cooccuring events (Turino, 2008, p.8). Symbols are signs whose objects have been agreed upon through the use of language (p.10). Signs are both powerful and dangerous in art. While indices can be particularly vivid for the observer or listener, creating a deep connection between the sign and its object, the artist runs the risk of the observer/listener having a different understanding of the sign. As Turino (2008) observes, the perceiver may not interpret the sign in the way the composer or artist intended, thus frustrating communication (p.7). Philip Tagg, in his work Music’s Meanings (2013), identifies two major reasons why a creator’s intended message may be misunderstood: codal incompetence and codal interference (pp.175–185). In the former, the breakdown in communication occurs when the creator and receiver of the sign “don’t share a common store of signs” (p.179) and results in “‘inadequate response’ in terms of the music’s original . . . intentions” (p. 179, emphasis in original). The latter occurs when creator and receiver share the same body of signs but differ in the values they attach to the sign’s object (p.192), resulting in “‘adequate response’[being] obstructed byfactors relating tothe receiver’sworld view, setof social or moral values, socialisation strategies, etc.” (p.182). Multimedia formats provide greater control over the creation and use of signs, and particularly indices: sign and object can be repeatedly juxtaposed, as happens when music is consistently used to accompany a specific character or place. The use of music to create nostalgia on television is one such example, as discussed by Faye Woods (2008) and Dan Sharpe (2012), for instance. The medium of video games provides particularly striking examples of the use of musical indices to effect nostalgia, coaxing the player into a strong emotional attachment to the game world and the characters who inhabit it. The inherent interactivity of the medium necessitates some additional terminology to clarify the distinction between elements of gameplay and aspects pertaining to the story. The term ludo refers to elements of gameplay: rules, mechanics, and the like; these are the elements that determine how the player can interact with the game world. Narrative, in contrast, refers to story elements. Most games have elements of both; William Gibbons, in his paper “Framing Devices for Gaming Devices” (2012), used a spectrum to illustrate gradations in the balance between the two; a modified version can be seen in the following example. Uncharted 3 is the most exciting game in the world, but only until you deviate from the script. Even in this case the conflict between the developer’s theatrical choreography and player-controlled interactions is clear. In order to ensure each set-piece is set off correctly, the game commits the cardinal sin of insinuating you have full control of your character, but in fact tugging you towards trigger points – making sure you’re in the right spot to tumble over the bonnet of that braking car, for example. Likewise, mistimed leaps are given a gentle physics-defying boost to reduce the staccato rhythm of having to restart a section. It’s entirely understandable given what the developer is attempting to achieve – an unbroken flow of action that leads to climax – but, at the same time, beneath the spectacle there’s a nagging feeling that your presence in the scene is an irritation rather than a preference. While the gameplay was in some ways diminished, the narrative draw pulled gamers in. In the middle of the spectrum, then, are games that contain balanced amounts of both sides. Both Gibbons and I place the Legend of Zelda series in this position, as the game integrates ludo (exploring, puzzle solving, and combat) into its narrative structure. Bastion (Supergiant Games, 2011a), an indie game whose genre is difficult to pinpoint, has an unusually cohesive sound, as virtually its entire soundscape was performed by its composer, Darren Korb (2012). Korb recorded all the instruments and performed the vocals for Zulf. Most of the pieces in the soundtrack function as non-diegetic music, instrumental pieces that occur underneath Rucks’s narration, which continues throughout the game. Two songs, later contrapuntally combined into one, are named as belonging to characters and are presumably meta-diegetic: “Build that Wall (Zia’s Theme)” and “Mother, I’m Here (Zulf’s Theme)”. The emotional power of Korb’s music and its effect on the player have been recognised by the gaming community, and the game has received many awards specifically for its score, including Best Original Score and Best Song (Spike VGAs); Best Original Score (Inside Gaming Awards); Best Music (Giant Bomb); Best Soundtrack and Rookie of the Year, (Game Audio Network Guild; this was Korb’s first experience scoring video games); Best Music (New York Videogame Critics Circle); Eargasm and Stylish Aesthetics awards (/v/GA Vidya Gaem Awards); and Best Musical Score and Best Story (The Game Effect), in addition to a number of more general awards (Supergiant Games, 2011b). Bastion leans towards the narrative end of Gibbons’ spectrum, as the continual presence of a literal narrative voice might suggest. The player’s immutable character, known only as “the Kid,” awakens after a cataclysmic event known as “the Calamity.” He travels the now-fragmented world, searching for the items needed to rebuild a safe area: the titular Bastion, to which he brings the handful of survivors of Caelondia that he finds (see Figure 2). The game thus begins right after the destruction of the world as the characters know it, and characters referencea time and place lost forever which the player has never actually known. The nostalgia, then, belongs to the characters, not the player. Some moments specifically attempt to highlight the nostalgia immanent in the world. The scene depicted in Video example 1 – in which the Kid rescues Zulf, who has betrayed him for reasons neither the Kid nor the player yet understands – is highlighted as one of these by its accompanying music, “Mother, I’m Here”. The music encourages this nostalgic interpretation. In contrast to the dense texture and varied timbre that characterise most of the soundtrack, a sound that Korb called “acoustic frontier trip-hop”, Zulf’s theme is heard above a sparse, chordal guitar accompaniment. The slow tempo, minor mode, and limited vocal range of the piece seem intended to be iconic signifiers of nostalgia, while the vocal line abounds in paralinguistic anaphones. The singer, acting as Zulf’s voice, adopts an intimate, plaintive sound, which combines with the repeated descending semitone and tone gestures (as at the word “Mother” in the last line of the refrain) creates an anaphonic representation of crying or sighing and the emotions of grief and, perhaps, despair. These musical gestures reinforce the message of the text and deepen the player’s emotional connection to the characters, and, ultimately, to the game. However, because the music is newly composed and the player does not yet know Zulf’s story, the risk of codal incompetence is fairly high: perhaps the player has never heard songs such as “Momma Look Sharp” from 1776, in which an unrefined male voice sings a simple tune above a sparse accompaniment calling out for his mother in grief, and instead associates the intimate and direct sound with singer-songwriters. Zulf’s connection with nostalgia is strengthened as the game progresses. The player finds out that hehad proposed the evening before the Calamity, celebrating all night only to wake up in the morning to find that his fiancée and everyone else he knew and loved was dead, either vaporised or turned to ash. At the end of the game, the player must decide whether to use the Bastion’s power to revert the world to its pre-Calamity state or move the survivors to a new location to begin a new life; while Zia urges the Kid to move on, Zulf would rather act on his nostalgia and return to his lost time, home, and love. Regardless of the player’s choice, the last music the player hears is “Setting Sail, Coming Home,” which layers Zulf’s and Zia’s themes into one song. Here, the reappearance of Zulf’s music becomes an anaphone of the sensation of isolation: though the two songs are combined, they do not interact in a substantial fashion. Instead, we hear the competing interests of Zulf and Zia as simultaneous but irreconcilable – the player must choose between the two mutually exclusive options of going forwards or backwards. Thus, the music of Bastion supports the narrative linking Zulf to the concept of nostalgia and creates an empathetic feeling of nostalgia in the player on behalf of Zulf, who wishes to return to a time and world the player has never seen. Fallout 3 takes a completely opposite approach, relying on the player’s semiotic associations with the preexisting music that makes up the most recognisable portion of its score. As in Bastion, the player is immediately thrust into an already-destroyed world: Washington, DC, decimated by a nuclear attack and now called “Capital Wasteland.” While the game is ostensibly set a few hundred years in the future, the music and aesthetic choices of the game evoke a world in which the Cold War heated up and mutual destruction did occur, a world in which the US was mangled by Chinese nuclear weapons. The player’s character is a Vault Dweller, a person lucky enough to have been protected from the radiation by an underground shelter. He or she is forced to leave the safety of the vault after his or her father goes missing, entering a world warped both by the initial destructive power of the bombs and the radiation they unleashed. The player encounters both mutated humans and animals, and radiation even becomes an element of ludo, as the player must control their own radiation poisoning through the use of items like Rad-X and Rad-Away. the player is present at the birth of his or her character, selecting a gender and deciding on physical appearance. The player has the option to make a character that resembles him- or herself or that has nothing in common with him or her physically. Either way, the act of creating an avatar helps the player connect with their character and the game itself. The most memorable portions of Fallout 3’s musical world consist of pre-existing popular songs from the 1930s to 50s. They are figured as diegetic through the use of the Pip-Boy, an in-game tool used to link many of the necessary ludic elements (player health, inventory, etc.) to the narrative (see Figure 3). The Pip-Boy also includes a radio, which can tune in to a variety of stations in the wasteland. While there are a number of smaller stations, two major stations (Galaxy News Radio and Enclave Radio) are narratively important, supporting opposing factions. Both play similar music, drawing from a genre that reinforces the feeling that this is a world that has lost the Cold War. It should be noted, however, that while these songs form the most recognisable portion of Fallout 3’s soundscape, there is a substantial amount of newly-composed non-diegetic music by composer Inon Zur. Given Zur’s symphonic background music for the game, the popular music functions as a genre synecdoche, “[connoting] paramusical semantic fields – another place, another time in history … not by synaesthetic or structural homology, but by the intermediary of another (‘foreign’) musical style” (Tagg, 2013, p.525). The songs’ warm sound and imperfect fidelity, a result of the techniques and materials used to record them, as well as their orchestration and vocal style, mark them as remnants of an earlier, “foreign” time. This music summons the time and place of its creation: America in the inter-war and post-war era, a time far removed from the game’s present. This music thus ensures that earlier, pre-apocalyptic world is constantly present in the player’s mind at some level. However, the significant time that separates the creation of the music from its use as a sign in this game leaves the door open to both codal incompetence and interference. While the music’s overall sound is instantly recognisable to anyone familiar with the repertoire from which the soundtrack is drawn, that familiarity cannot be assumed to be shared by the entire audience: anyone who was a teenager when the music was originally released would be at least 70 years old today, hardly the target audience of the first-person-shooter genre. Beyond the incompetence that could result from a teenager today having no prior knowledge of music popular six decades prior, the distance also provides opportunities for codal interference. Rather than convey images of white picket fences and domestic felicity, the racist imagery of some of the songs (e.g., “Civilization” sung by Danny Kaye and the Andrews Sisters) and the strict gender roles portrayed by others either through text (as in South Pacific’s “(I’m in Love with) A Wonderful Guy”) or through vocal roles might arouse disgust for that time and world by anyone for whom recognition of that time brings to mind the power imbalances of the era. The strongest nostalgic impact of this music, though, is predicted on the player’s semiotic relationship to it. Fallout 3 expects a nostalgia for a time in the real world, a time the player knows about and can imagine. 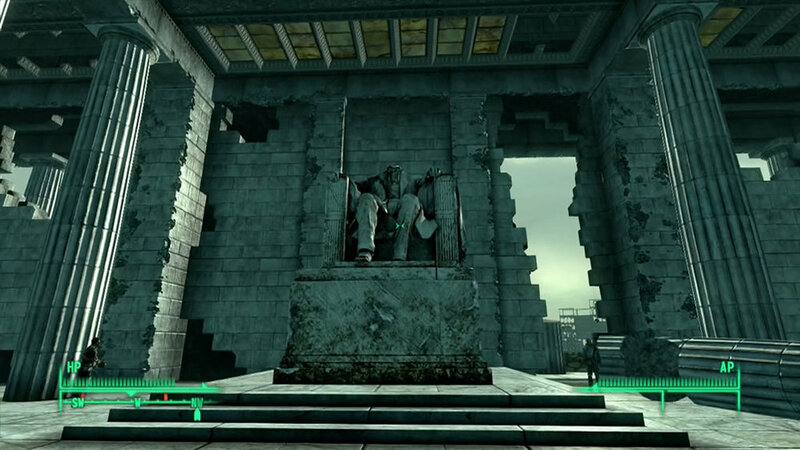 It relies on destroying a place known to the player; as can be seen in Video example 2 and Figure 4, the developers chose some of the most iconic landmarks in the United States for destruction. As the player progresses through the game, the music and visuals combine constantly to evoke a time and place that are gone forever, a time lost to the past in the real world and a place destroyed in the game, a place the character has never seen intact. The Legend of Zelda is a series of first-person action-adventure games developed and published by Nintendo. The games that comprise the series have appeared on virtually every console in the company’s history (see Table 1 for a listing of all major games in the series, along with the console on which they appeared and the year they were released in America). The usual narrative structure involves Link, a silent hero typically dressed in green, rescuing the eponymous Zelda, who has been captured by the evil Ganon. Along the way, he must explore a variety of areas, acquire useful tools, defeat bosses, and eventually acquire the Triforce, a sacred relic. While this is the standard formula, established in its first iteration, Nintendo has not been afraid to experiment with the games. I had to create all of those memorable tunes with only five tones of the classic do-re-mi scale. Specifically: re, fa, la, and ti (and the higher-scale re). Since each of those songs, like Zelda’s Lullaby or Epona’s Song, had a particular theme, it was quite challenging, but I think it all felt really natural in the end. Then as soon as I was finished with those Ocarina songs, I had to create even more for Majora’s Mask —I got a lot of mileage out of just five tones! . . . I think I’m most inspired to create when I am creating under limitations—whether it’s by system or by musical theme (Kondo, 2005). The pieces that Kondo created out of these limited materials are brief but instantly recognisable, distinct and evocative of their associations. As shown in Figure 6, which depicts the inventory screen, the tunes are grouped into two types: the multicoloured ones on the bottom row are warp tunes, used to transport Link to specific locations; the white ones on the upper row have more general purposes. For instance, “Epona’s Song” allows the player to acquire and summon a horse, making in-game travel faster. “Sun’s Song” can both change the time of day and freeze zombie-like creatures called Redeads. These two pieces are quite useful, demonstrating some of the possibilities for music to interact with ludo. The other four songs (”Zelda’s Lullaby”, “Saria’s Song”, “Song of Storms”, and “Song of Time”) all have important narrative functions in addition to their uses in game play: the player must play the correct song in the correct place to progress within the story at certain points. “Zelda’s Lullaby,” a piece that is both indexically and symbolically linked to Princess Zelda and, by extension, the Royal Family of Hyrule, has lofty narrative uses, though its effects on the game play world are a bit more prosaic (the player can use it to repair broken signs). One piece in particular, though, is virtually equally important for its ludic and narrative functions: “Song of Time” (Figure 7). Playing “Song of Time” at the appropriate time and place triggers one of the most dramatic narrative events in the entire game, opening the door to the Sacred Realm and the Master Sword; this act has unintended consequences, as Link is too young for his destiny and so is sealed in the Sacred Realm for seven years while Ganondorf wreaks devastation on Hyrule. The song is also significant from a ludic perspective, as it can summon or dispel a certain kind of block; its ability to do so is necessary to solve several puzzles within the game. In addition, the “Song of Time” acts as the ambient music for the Temple of Time, a major location within the game to which the player must return whenever he or she wishes to go backwards or forwards in time. Ocarina’s direct successor, Majora’s Mask (Nintendo of America, 2000), continued the use of music as a gameplay element. Link leaves the land of Hyrule and finds himself in an alternate universe, where he must save the world in three days. He takes his ocarina with him, learning some new songs (as mentioned in the quotation from Kondo above), and remembering some from Ocarina. “Epona’s Song” and “Song of Storms” both return, and the “Song of Time” is even more important, as with it the player can reverse, slow, or speed the passage of time. The “Song of Time” and the ocarina are thus even more completely integrated into the game. Nearly ten years after Ocarina’s release, Nintendo created what IGN called its “true spiritual sequel” (Casamassina, 2006) in The Legend of Zelda: Twilight Princess (Nintendo of America, 2006). Link’s comparatively realistic look returns, the player finds him- or herself back in a more familiar Hyrule, and, while the player is not given an ocarina, musical choices within the game evoke a nostalgic response from the player. These feelings heighten the player’s emotional connection with the world and with Link. At this point, this paper must by necessity become more personal, as I will use my own experience to illustrate the semiotic implications of these games. Twilight Princess is set approximately one hundred years after the events in Ocarina of Time, and there are many links between the two that make sense from an in-game perspective. Link, who gains the ability to transform between human and wolf forms, meets the spirit of one of his predecessors, who teaches him specific abilities. In order to encounter the former hero, Wolf Link must find specific stones around the game world and howl the music inscribed upon them. The player can control the pitch to a limited degree with the analogue stick, matching the high, medium, and low notation on the stone. While this notation is nowhere near as precise or familiar to a musician as the ocarina notation pictured in Figure 5, it still gives music making an element of ludo in the game. The songs howled on the stones are drawn from multiple entries in the series, and Ocarina of Time, unsurprisingly, is well represented. Were the musical references in Twilight Princess limited to the Howling Stones, the level of integration could be considered simply an inside joke. However, the musical connections run deeply. Twilight Princess abounds with musical references to other games in the series, some limited in scope, some elaborated, and some so similar that they are jarring. Since music has played such an important role in the series and the connections are so frequent and direct, these links to past games are more than just “Easter eggs”. While the game functions perfectly well for players with no previous experience with the series, the richness of the world and the emotional importance of specific places and events are heightened through these allusions to other entries in the series. Here, the series’valuable level of control over its internal associations becomes apparent: while the pieces are unique to the series, thus minimising unintended interpretants and codal interference, the persistence of the musical materials allow for strong connections to be made. The pieces are uniquely identified with the series, and each new entry in the Zelda franchise only strengthens the music’s semiotic power. Several places and species return from earlier games: the Zoras, an aquatic race, still reside in Zora’s Domain along the path of a river, and the Gorons, who eat rocks, still live on Death Mountain, an active volcano. As the hardware has improved, the graphics and spatial elements have become more complex and expansive. The game verbally tells the player that these are the same places and peoples of earlier games, particularly Ocarina of Time, but what helps this impression really sink in is the music. Familiar themes, indexically related to specific places through their looped performance as ambient music, return in re-orchestrated and expanded forms, taking advantage of greater system capabilities. When the player travels to Death Mountain, he or she immediately hears the same melodic and harmonic material that played in Goron City in Ocarina of Time; this music, indexically related to the home of the Gorons, conveys immediate information to the player and may invoke feelings of nostalgia, as the player not only links the music to an in-game location but also to the time when he or she played Ocarina, perhaps summoning memories of childhood, a time irretrievably past. Similarly, Kakariko Village’s musical theme returns, strengthening the connection between the games in the player’s mind and summoning more indexical subjects. Musical markers like this clearly identify the game as one proud of its musical heritage. My indexical relationship to many of these songs, firmly linked with in-game places and images of my childhood, made my connection to the game much more immediate and vivid. Ocarina of Time was one of the first video games I played, and I spent hours finding every secret in its landscape. I was primed for nostalgia, as even the act of playing a Zelda game brought with it childhood memories; each musical reference and citation indexed the places, people, and experiences I had with Ocarina. When I entered Kakariko Village and heard its familiar theme play, it only strengthened my emotional ties to the game and, of course, my sense of nostalgia. Both Death Mountain and Kakariko Village differed enough in space, appearance, and sound from their counterparts in Ocarina that while they evoked those feelings, they didn’t feel like places I had visited before. One area, though, was virtually an exact replica of a location in Ocarina: the Temple of Time. When Link reaches the Sacred Grove in Twilight Princess (Video example 4), he finds a set of ruins, including a destroyed staircase and a plinth that houses the Master Sword. When he climbs around to the top of the stairs, he finds an intact door that opens into the past. As he passes through the doorway, he is transported to a place that is no longer exists in his time and world, the same Temple of Time that the player visited so frequently in Ocarina of Time. While it, like everything else in the game, is rendered at a higher definition and on a larger scale than in Ocarina, the layout is virtually the same. Furthermore, the player is also greeted by an almost identical version of the “Song of Time” as was used appeared as ambient music in Ocarina’s Temple.The version of the song appearing in both games’ Temples of Time features wordless male (MIDI) voices singing in unison, a paralinguistic anaphone of the sound of chant, and the reverberation in the track creates a spatial anaphone calling to mind a large, sonically live space appropriate to the cathedralesque Temple, all appropriate and helpful connections (Tagg, 2013, pp.500–501). To a player who had experienced Ocarina of Time or Majora’s Mask, however, there is a more specific meaning attached to this music: the motivic content is instantly familiar, and the appearance of a virtually indistinguishable recording inside a recreated Temple of Time is unmistakably a connection to Ocarina of Time. To me, the jolt of recognition was almost shocking, as I found myself recreating my past just as Link explored his world’s own on screen. This is perhaps the most literal example of nostalgia in the game, as Link is transported to a time and place lost in his world, travelling through doors to explore a ruin’s past, while the player is invited to experience a recreated version of his or her own gaming memories. The next console game in the series, Skyward Sword (Nintendo of America, 2011), was the Wii’s swansong. Just as Twilight Princess ushered in the Wii and concluded an external arc that began withOcarina of Time, Skyward Sword was one of last major games released for the Wii and it began a new story arc: ultimately, the player learns that Skyward Sword begins the entire series’s story, as the ending places the game as first in the world’s internal chronology. After Link defeats Demise, the final boss, Demise pronounces a curse that he and Link will be locked together in unending battle, their descendants destined to recreate the struggle eternally. The endless chain of nearly identical Links is thus explained, with the player as another thread connecting them together. As the earliest part of the adventure chronologically, in-game nostalgia would be narratively inappropriate in Skyward Sword. Instead, Nintendo took the opportunity to explore new places and ideas. Music is still an element of the game, though it is relegated to an almost exclusively narrative role: Link is given a harp, which that the player strums by moving the Wii remote, that can be used to trigger events necessary for progress. The player has limited control over the music the harp plays, simply matching his or her Wii-remote waving to the time of a pulsing circle. For players who know where to look, though, there are musical references, although these are much more subtle than those in Twilight Princess. The most significant is that the “Ballad of the Goddess”, one of the most important musical motives in the game, is a retrograde version of “Zelda’s Lullaby”. This is a clue for the player that there is a connection between the goddess Hylia and Zelda, which is confirmed by the game at the story’s conclusion. Nintendo did not neglect the opportunity to encourage player nostalgia, however. As 2012 marked the twenty-fifth anniversary of the series, Skyward Sword  included a compact disc of fully orchestrated versions of some of the series’most recognisable melodies. The creators of Bastion, Fallout 3, and The Legend of Zelda series have used semiotic associations to invoke very different kinds of nostalgia for different purposes. In Bastion, the player’s empathetic nostalgia for the destroyed Caelondia is created through narrative and musical choices that allow the newly composed soundtrack to reference loss in a variety of fashions. In contrast, Bethesda used songs from the “real world” in Fallout 3 to create a nostalgia for a past, albeit one that is perhaps idealised, within player’s own world, destroyed in the game long before the character is born. Finally, the music ofThe Legend of Zelda is so tightly woven into the fabric of the games and the player’s experiences with it that it can be used to trigger indexical associations for the player that parallel the nostalgia the narrative imposes on the player’s character. “Nostalgia”, Oxford Dictionaries, Oxford University Press, http://www.oxforddictionaries.com/us/definition/american_english/nostalgia [accessed 19 December 2013]. Search conducted at www.oxfordmusiconline.com on 19 December 2013. In addition to adding an immediately recognisable feature to the game, Rucks’ narration creates a more cinematic experience; while there are options and gameplay choices the player must make, the game is presented as a story being told, as though it had already happened and was just being recounted in a fixed form. It feels fluid, cinematic, and responsive. Tagg defines paralinguistic anaphones as “the musical stylisation of non-verbal vocal expression” (Tagg, 2013, p.492). Tagg includes this as a vocal costume that implies a certain level of authenticity, and “Mother, I'm Here” does fit into each of the stylistic conditions he sets out: “ the voice is no-one else’s and does not appear to conform to norms established through formal training or audio technology;  the worlds are intelligent or enigmatic, thoughtful or provocative, poetic or witty and usually audible: the artist’s voice is up front and centre stage;  the song, recorded or performed live, should not bear obvious traces of intricate arrangement, orchestration or audio signal processing even if it may well have been subjected to such types of treatment” (Tagg, 2013, pp.373–374). While Korb did perform virtually the entire soundtrack of Bastion, his voice only appears as that of Zulf; his voice is clearly foregrounded; and the arrangement is simple, the orchestration is a single guitar presumably played by the singer, and there are no obvious markers of processing. “Let’s Go Sunning” dates from 1954, making it one of the newest songs included on the soundtrack. In order for our hypothetical original listener to have been a teenager (13) when the song was released, he or she would have to have been born in 1941, making him or her 67 years old when Fallout 3 was released in 2008 and 72 in 2013. “Way Back Home” is one of the older songs included, released in 1935, and by the same metric our hypothetical listener would have been 85 when the game was released and 90 today. Instead, it appears that interest has worked the other way. If one searches the iTunes store for “Bob Crosby and the Bobcats,” the comments indicate that Fallout 3 led them to seek out this music (Bob Crosby and the Bobcats, 2006). I have excluded re-releases, remasterings (i.e., The Wind Waker HD on Wii U and Ocarina of Time 3D on 3DS), and minor games (i.e., Link’s Crossbow Training, which was released on the Wii to demonstrate the system’s motion-control capabilities). The four C buttons and A on the Nintendo 64 and L, Y, X, R, and A on the 3DS. In addition, the player can raise and lower the pitch by using Z and R on the N64 controller and bend the pitch with the analogue stick. The official Nintendo guide for the game included what amounted to sheet music for the Kakariko Village theme at the end of the book, with the idea that the player could perform it in-game for his or her own enjoyment (Nintendo of America, 1998b). See video example 5, for the symbolic linking of Princess Zelda and “Zelda’s Lullaby,” as Zelda’s attendant, Impa, states the connection. The piece is also played when Zelda is present; see video example 6, as an example of the music’s performance indicating her presence to the player before it has been verbally or visually confirmed. The Legend of Zelda: Skyward Sword was released in North American on November 20, 2011, almost exactly a year before the release of the Wii’s successor, the Wii U, on November 18, 2012. While Wiis are still available (a new model, the Wii mini, was released in the United States in November 2013), there have been few exclusive games released since Skyward Sword, and most of the games published for the Wii since the Wii U’s release have been licensed games, sequels, and other non-exclusive titles. Bethesda Game Studios (2008) Fallout 3 [Xbox 360, PS3, and PC Game]. Casamassina, M. (2006) The Legend of Zelda: Twilight Princess. Review: Is This the Greatest Zelda Game Ever Made or Not? [Online] Available at: <http://www.ign.com/articles/2006/11/18/the-legend-of-zelda-twilight-princess-review-2> [Accessed 13 December 2012]. Bob Crosby and the Bobcats (2006) The Complete Standard Transcriptions: Bob Crosby and the Bobcats. [iTunes Album] Available at: <https://itunes.apple.com/us/album/way-back-home/id135658179?i=135658443> [Accessed 19 December 2013]. Edwards, S. (1969) 1776. New York: Music Theatre International. Gamasutra (2011) Interview: Storytelling through Narration in Bastion. [Online] Available at: <http:// www.gamasutra.com/ view/ news/ 36327/ Interview Storytelling Through Narration In Bastion.php# .UMpph3y9KSM> [Accessed 13 December 2012]. Gibbons, W. (2012) Framing Devices for Gaming Devices: Applying Film Music Theory to Video Games. In AMS (American Musicological Society), 78th Annual Meeting of the American Musicological Society. New Orleans, LA, 1–4 November 2012. Unpublished. Holkins, J. (2011) Working Conditions. [Online] Available at: <http://www.penny-arcade.com/2011/11/04> [Accessed 13 December 2012]. Kondo, K. (2005) Inside Zelda, vol. 195, pt. 4. [Online] Available at: <http://www.zelda.com/universe/game/twilightprincess/inside04.jsp> [Accessed 14 December 2012]. Korb, D. (2012) Interview on Top Score. Interviewed by Emily Reese. [Podcast] Minnesota Public Radio, 8 June 2012. Korb, D. (2011) Bastion: Official Soundtrack. [Digital download]. Naughty Dog Studios (2011) Uncharted 3: Drake’s Deception. [PS3 game]. Nintendo of America (1998a) The Legend of Zelda: Ocarina of Time [Nintendo 64 game]. Nintendo of America (1998b) The Legend of Zelda: Ocarina of Time. Official Player’s Guide. N.p. : Nintendo of America. Nintendo of America (2000) The Legend of Zelda: Majora's Mask. [Nintendo 64 game]. Nintendo of America (2006) The Legend of Zelda: Twilight Princess. [Wii and GameCube game]. Nintendo of America (2011) The Legend of Zelda: Skyward Sword. [Wii game]. Parkin, S. (2011) Uncharted 3: Drake’s Deception. Review: Smoke and Mirrors? [Online] Available at: <http://www.eurogamer.net/articles/2011-10-21-uncharted-3-drakes-deception-review> [Accessed 13 December 2012]. Rovio Entertainment (2009) Angry Birds. [iOS game]. Supergiant Games (2011b) Bastion. [PC, Xbox 360, and iOS game]. Supergiant Games (2011a) Bastionwins 100+ Awards, Sells More than 500,000 Copies. [online]. Available at: <http://supergiantgames.com/?p=1286> [Accessed 13 December 2012]. Tagg, P. (2013) Music’s Meanings. 4th ed. New York: Mass Media Scholars’ Press. Turino, T. (2008) Music as Social Life: The Politics of Participation. Chicago: University of Chicago Press. Sarah Pozderac-Chenevey is a PhD student in musicology at the University of Cincinnati College-Conservatory of Music, where she taught the course “Music and Society” this year. Her research interests include diva studies, critical editing and historiography, the music of Reform Judaism, and, of course, video game music. She served as the editor of Volume 27 of Music Research Forum, a peer-reviewed journal published by the University of Cincinnati, and was a member of the executive board for the conference "Music and Meaning," organized by the CCM Music Theory and Musicology Society in 2012.